Is there anything better than the sound of a sleeping baby? Coming into a new world is stressful and emotionally draining. And who wants to sleep alone? 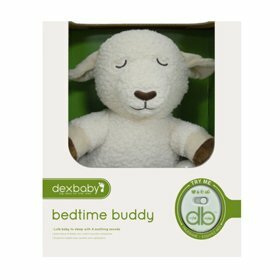 The Buddy Womb Lamb sound machine helps alleviate some of the anxiety of bed time by incorporating the soothing, familiar sounds of the womb. Nested inside the stuffed sheep is a sound box with 4 soothing sounds: Mother's Hearbeat (Traditional womb sound - Actual recorded sounds of the womb) Babbling Brook Summer Night Ocean Surf Volume controls and sound settings can all be controlled from the machine which is easily removable from the back of the stuffed animal. The womb sound is comforting to a young baby, helping them relax and fall asleep. Mom and dad will sleep better, too. The internal speaker runs on 3 AAA batteries and shuts off after 15 or 60 minutes. You decide. Because the box is removable your little one will love this familiar buddy even after the sound is no longer needed. It can be washed and passed down from generation to generation. Safely secure the lamb to the crib (or anywhere else) with the ultra strong hook and loop. Take the stuffy on car rides, too. Soft and cuddly, your baby will love their sheep for years. MIRACLE SLEEP AID - The Buddy Womb Sheep helps alleviate some of the anxiety of bed time by incorporating the soothing, familiar sounds of the womb. Mom and dad will sleep better, too.It also features 2 timer settings for automatic shut-off after either 15 or 60 minutes. 4 SOOTHING SOUNDS - Mother's Heartbeat - Actual recorded sounds of the womb help remind baby of the calming serenity of mommy's womb; Babbling Brook, Summer Night and Ocean Surf.Audio box uses 3 AAA batteries (included). CUTE, CUDDLY, SOFT AND WASHABLE - The adorable, plush sheep texture is washable. Because the sound machine is removable, your baby will grow up with his/her buddy as the stuffed animal of choice. SAFELY SECURES - Its quality Hook and Loop strap allows you to securely attach it to a crib, cradle, swing, stroller, car seat or anywhere you can find a spot to wrap the loop around. AUTOMATIC SHUT-OFF TIMER - Fall asleep and stay asleep. With its preset timer option, play your favorite sounds and it will automatically turn off in 15 or 60 minutes. You decide. If you have any questions about this product by DexBaby, contact us by completing and submitting the form below. If you are looking for a specif part number, please include it with your message.